Climate is a long-term weather pattern that is typical of a certain area. Climate data is based on statistics over the past years. Yandex.Weather takes into account the actual data over the past 10 years. For each city, the service shows data on sunny and rainy days, temperature charts and graphs, the amount of precipitation, and air humidity. 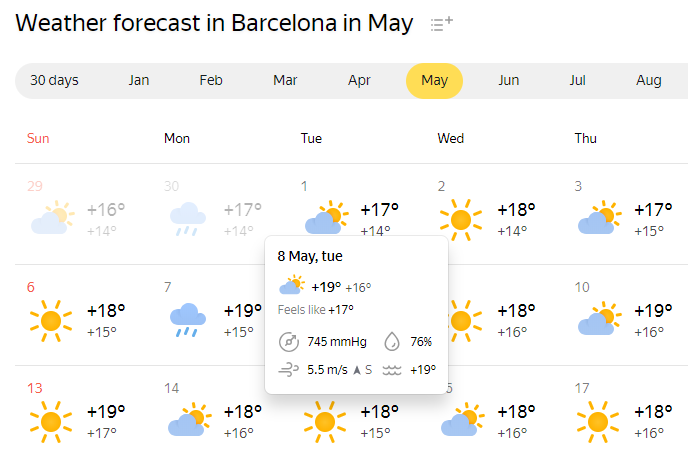 The forecast for the next 10 days is made using the Meteum technology. Longer-term forecasts reflect the average climate normals for the region over the past 10 years. To find out your city's climate, go to the Monthly forecast tab at the top of the page. The city is determined automatically based on your location. To specify your exact location or find out the climate of another city, enter its name in the search bar. — Daytime and night-time temperature. — Wind speed and direction. — Water temperature (for cities located near large water bodies).